Even though the migration is over there is still plenty of amazing wildlife to see on our beautiful heathland. The first juvenile birds have been spotted and are starting to make their way in the world. After a few worrying weeks of not seeing many Stonechat, something I attributed to the bad weather back in March, there almost appears to be a resurgence in numbers, with several wardens spotting young downy birds ‘chatting’ away in small family groups perched on the gorse and heather. 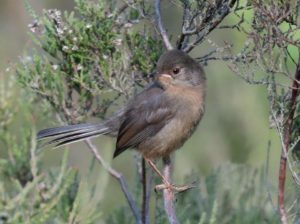 The most encouraging sighting of all though, a juvenile Dartford Warbler, was spotted by a local birder and photographer on Barossa. This is a very welcome sight on the Thames Basin Heaths as after terrible weather in March, there were and still are concerns that their numbers would be severely affected. Because Dartford Warbler stay in the UK all year round and only feed on invertebrates they are particularly vulnerable to cold snaps during the winter and spring, although mature stands of correctly placed gorse can help mitigate this. They may have up to 3 broods between April and July and having dropped to maybe just 10 pairs in the 1960’s they now number around 3,200 breeding pairs. With the Thames Basin Heaths being home to around 15% of the UK’s breeding population (486 pairs 2017) the Special Protection Area is a great place to see this secretive little bird. Heathland is not only an amazing place to see our ground nesting birds, it is also a fantastic habitat for our six native reptile species – Slow Worm, Grass Snake, Adder, Sand Lizard, Common Lizard and Smooth Snake. 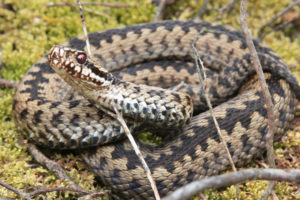 Adder are an iconic heathland species that is usually most commonly labelled as the only venomous snake in the UK. While this is true there is so much more to this beautiful reptile than this. Identified by the distinctive zig-zag pattern along its back, the male and females are usually quite easy to tell apart by the different colouration of the sexes, with males being anywhere between cream, white and greyish in colour with a very distinctive black zig-zag contrasting against the main colour of the individual. Females however are usually a reddish brown, with the pattern on the back contrasting less. Females tend to breed every two years and unusually give birth to 3-18 live young, with the young hanging around the female for a few days after birth. These young will be born in late August to early September and won’t feed until the following year. Between April and May you might be lucky to see two adders performing the so called ‘Adder Dance’. Once thought to be a mating display it is actually two rival males fighting for the right to a nearby mate. They will entangle their bodies and try to force the other to the ground as a sign of strength, with sometimes more than two males involved in the contest. Adders are also pretty long lived and generally live between 10 and 15 years of age, although there is high mortality in the first year of hibernation there are reports of some individuals living over 20 years! 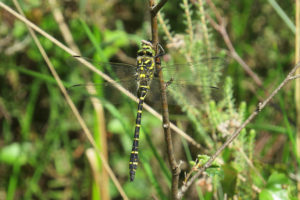 Other wildlife highlights this week include the first sighting of Golden-ringed Dragonfly on Wildmoor Heath and Lightwater Country Park. This striking species can easily be identified even at a distance due to its distinctive colouration of black and yellow. They are absolutely stunning when encountered, it is one of the UK’s biggest dragonfly and actually holds the claim of our longest species, with the largest being the Emperor. It is closely associated with heathland and can often be seen hunting over open heath and the bog systems on sites like Wildmoor Heath. Wildmoor also offered a fantastic viewing of a Hobby hunting low across the bog, catching dragonflies with mind boggling ease – it almost seemed to enjoy it! Luckily for some passing members of the public I was able to show them this characterful raptor, while it took a break in one of the few trees in the bog, helping them also to identify the amazing abundance of dragonflies and damselflies ranging from Keeled Skimmer to the mighty Emperor and everything in between. Bramshill had a singing Firecrest this week, this being the 2nd I’ve heard on the Special Protection Area this year. Unfortunately as is sometimes the case it wasn’t willing to show its self, so I had to content myself with hearing its lovely trilling song. I also managed to check a couple of pairs of Redstart, with chicks, on the northern edge of Barossa. A slim, striking bird, the common redstart has a distinctive bright orange-rufous rump and tail, which are particularly conspicuous in flight and during this species characteristic tail-quivering displays. It is these displays and the striking colours that earned it names such as Firetail, Jenny Redtail and, the most fitting of all, Fire Flirt in times gone by. The Redstart has gone through a 55% decline in the last 25 years and is an uncommon breeding bird in the South East of England with the greatest numbers residing in the Wales and the North West of England.